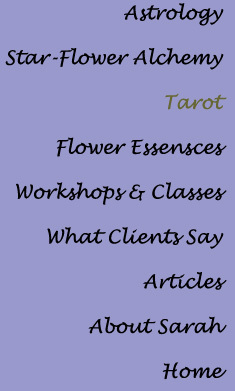 Tarot Readings provide a way of hearing inner guidance through the tantalizing images which come alive in a reading. They can be the light in a dark tunnel or the sword which cuts through the mist of confusion or obsession. The cards portray our inner wisdom which cannot be fooled or ignored. Used wisely the cards connect us with insight which opens our creative channels to live life to the fullest. Astrology sessions and Tarot readings are available in person in Natick, MA., or by phone 508.652.9880. Contact Sarah to make an appointment. You can contact me about a tutoring program tailored to your needs, put yourself on my mailing list to receive information about future group activities, or watch my web site for future teaching plans.